It is the most famous chariot festival in the world. Every year in June / July, the lunar month of Ashadh and the season of varsha or the rains, Lord Jagannath accompanied by Subhadra and Balabhadra ventures out of the temple for a slow and majestic journey down the avenue of Bara Danda. Pilgrims come by the thousands to crowd the Bara Danda, waiting for an unforgettable show. The three chariot cars called rathas with brightly coloured canopies are dragged down the road by devotees to the accompaniment of drums, conches, bells and the chanting of mantras. The first English visitors to see this festival were amazed at the sight of the Rath Yatra as they watched the crowds pulling the chariot and even saw some pilgrims killing themselves under the wheels to gain nirvana. So the English word ‘juggernaut’ meaning a huge uncontrollable force has entered the English language. As Lord Jaganath is an aspect of Lord Krishna this yatra re-enacts the journey of Krishna from his childhood home of Gokul to Mathura. The locals also call the yatra ‘Pahandi Bije’ and ‘Gundicha yatra’ and there are elaborate rituals connected to the festival. Also as non-Hindus are not allowed into the temple, this is the one time in a year that everyone can view the three icons and people of all religions, castes and gender are allowed to pull the ropes. The wooden chariots are made anew every year for the festival and after the festival is over they are broken up and the sacred wood is sold to pilgrims. As the three chariots wait before the temple’s gate, the simhadwar, the three images are taken out of the sanctum sanctorum, the garbha griha and placed inside. It takes at least six priests to carry each image. The yatra only begins after the King of Puri, who is the premier servant or ‘sevak’ of Jagannath uses a gold handled broom to sweep the chariots. Long, thick ropes are attached to the chariots and now pilgrims hold and pull them down the road. The festival lasts for nine days, between the second and tenth day of the shukla paksha, the bright fortnight of Ashadha. The procession ends in the evening at the Gundicha temple that is three kilometres down the road. Gundicha was King Indradyumna’s queen and is considered the aunt of Jagannath and his siblings. So they visit her garden palace every year. On the tenth day, the shukla dashami of Ashadh the return journey begins called the Bahuda Yatra. Jaganath and his siblings enjoy changing their garments and on this day the images are clad in golden attire called Shuna Besha. Each gorgeously decorated chariot has a cloth canopy, two rows of wooden carved horses with a charioteer placed in front and rows of huge wheels. Every chariot has a guardian deity and the horses, the charioteer, the flag flying on top and even the ropes have names. Also other gods and goddesses ride with the three main deities. The chariot of Balabhadra starts the procession, followed by Subhadra and Jagannath comes at the end. Jagannath’s chariot is called Nandighosh and it has sixteen wheels and a yellow and red canopy topped by a sudarshan chakra. The guardian deity is Garuda, the half bird half human vehicle of Vishnu and the charioteer is called Daruka. The horses are named Shankha, Balahaka, Shweta and Haridasha. The flag is Trailokyamani, the rope is Shankhachuda and the accompanying deities are Hanuman, Ram, Lakshman, Narayan, Krishna, Govardhan, Dharana, Chintamani, Raghav and Narasimha who ride with Jagannath. Balabhadra’s chariot is called Taladhwaja and it has fourteen wheels and a red and blue canopy. The guardian deity is Basudev and the charioteer is Matali. The horses are called Tibra, Ghora, Dirghashran and Swarnanava. The flag is called Urnani and the rope is named Basuki. The chariot also carries the images of the gods called Gadantakari, Harihar, Triambaka, Vasudev, Aghora, Pralambari, Natamvara, Tripurashiva and Mritunjaya. Subhadra’s rath travels in the middle and it has twelve wheels, a red and black canopy and is called Padmadhwaja. The guardian deity is Jayadurga and she has a very special charioteer – her husband Arjuna, the hero of the Mahabharata. The horses are called Ruchika, Mochika, Jita and Aparajita. The flag flying above the canopy is the Nadambika and the rope is swaran chura. Subhadra’s companions are all goddesses – Chamunda, Bhadrakali, Harachandika, Katyayani, Jayadurga, Varahi, Kali, Mangala and Vimala. 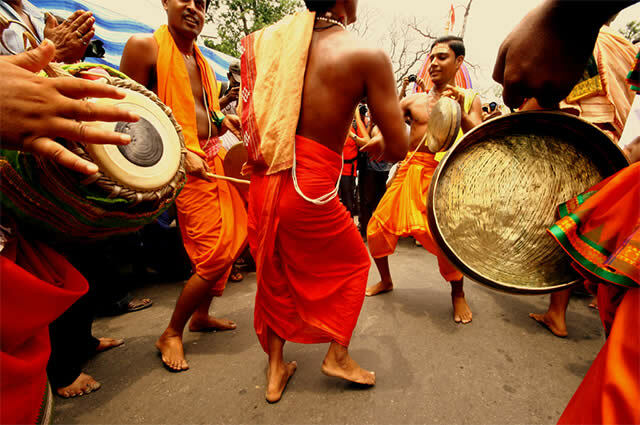 The most important festival is the Rath Yatra and the festivals go on year round at the Jagannath Temple. The exact dates for each festival according to the lunar calendar can be checked on the temple website: www.jagannath.nic.in. NAVAKALEVAR – this festival takes place after a gap of twelve or nineteen years when new images are consecrated in the temple. When two moonless amavasya nights occur in the month of Ashadh the Shabar priests seek out margosa trees in the forest that are then brought to Puri in a procession. The Shabras then carve the new images and Brahmin priests consecrate and place them on the ratnavedi in the sanctum. The old images are buried by the shabars in the temple compound. CHANDANA YATRA – In the month of Baisakh for twenty one days the representative images of the three deities are taken in procession around the lake called Narendra Pokhari. The procession takes place twice a day in beautifully decorated boats. SNANA YATRA – the full moon night in the month of Jyeshtha is called Deva Snana Purnima. The images are taken out of the sanctum and placed on the snana vedi and bathed with 108 pitchers of water. From this day the anavasara period of fifteen days starts when the sabars prepare the images for the Rath Yatra. 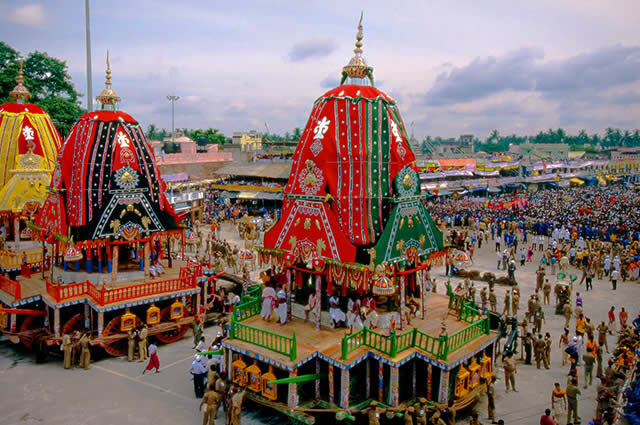 So till the Rath Yatra the deities are worshipped in private and cannot be seen by devotees. SAYANA EKADASHI – This festival is in the month of Ashadh when the chariots return to the temple after the Rath Yatra. The images of Vasudeva, Bhubaneshwari and Narayana are taken to the chariots for special rituals and then placed in a ‘chamber of slumber’ to rest for four months. DAKSHINAYANA SANKRANTI – special rituals are performed on the day of the Sankranti when the sun enters the karkat rashi. JHULANA YATRA is held on the tenth day of the shukla paksha in the month of Shravan when an image of Madan Mohan is placed on a swing. PARSVA PARIVARTANA EKADASHI falls in the month of Bhadra on the eleventh day of the shukla paksha. DEVA UTTHAPANA EKADASHI – this takes place in the month of Kartika on the eleventh day of the shukla paksha. PUSYABHISHEKHA is celebrated on full moon day in the month of Pausha. UTTARAYANA UTSAVA is celebrated on Makar Sankranti during the winter solstice with special rituals at the beginning of the time of Uttarayan. DOL YATRA – is celebrated on the full moon day of Falguna with the festival of colours that is also called Holi. Smaller images are brought out to a platform called the Dolavedi and placed on swings.